Dwarf Spheroidals: Where did all the metals go? 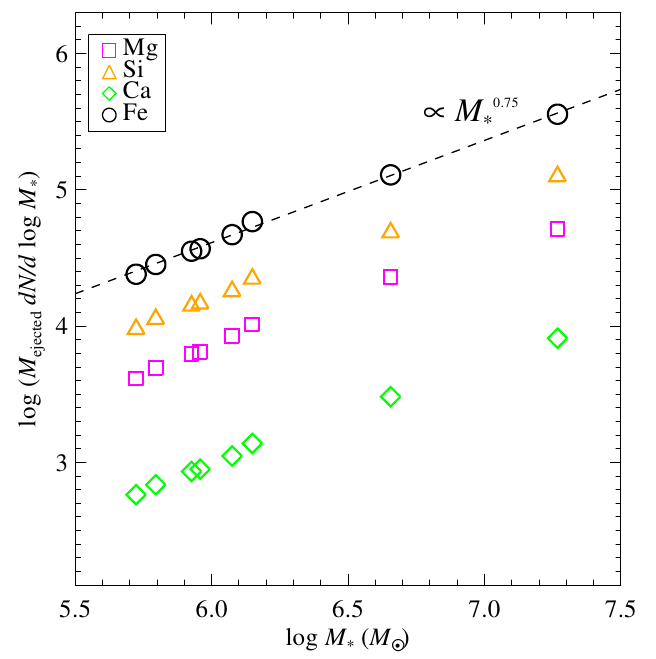 The total mass of various metals ejected by dSph galaxies of different masses. 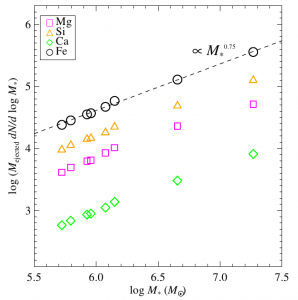 More massive dwarfs contribute far more metals to the IGM than less massive ones. Some galaxies get all the metals. Others, like the tiny ( ) dwarf spheroidals (dSph) orbiting the Milky Way (MW), seem to lose their metals as soon as they’re given them. New modeling by Kirby et al. suggests that these galaxies have forfeited more than 96% of the metals produced by their stars to the intergalactic medium (IGM) of the Local Group. The fundamental problem for the dSphs is their small mass. In all galaxies, supernova explosions are largely responsible for releasing metals into the interstellar medium (ISM) – the gas reservoir between stars from which new generations of stars are formed. Galaxies like dSphs have a low mass, and hence a shallow gravitational well, making it easy for the metals ejected in supernova explosions to become unbound from the galaxy entirely and fly off into the surrounding IGM. Kirby et al. estimate the mass of several different elements lost by 8 different MW dSphs over their entire ~10 Gyr lifetimes. They do this in two steps. First, they measure the present-day metallicity of stars in these galaxies and combine that with an estimate of the galaxy’s total mass to estimate the present-day mass of each element. Second, they use a model of chemical evolution to estimate the total mass of metals each galaxy has produced over its lifetime. The difference between these two masses is the mass of metals ejected. Each type ejects its own nucleosynthetic yield (composition of metals): type IIs primarily yield alpha elements such as O, while Ias primarily yield iron and its neighboring elements (iron peak elements). Outflow: Each SN is assumed to drive a fixed mass Aout out of the galaxy. Each of these factors has free parameters that used to fit them to observations of the present-day metal abundances of stars in each galaxy. Of course, there are also lots of factors this model ignores, including tidal stripping by the MW. One of the most interesting results of this paper is its consequences for the metal content of the IGM. Since the IGM is essentially the leftover gas from the Big Bang that didn’t make it into galaxies, you may expect it to have a primordial composition (only H and He). But observations of the IGM illustrate that some metals are present. A leading candidate for enriching the IGM are winds from dwarf galaxies. Kirby et al. suggest that, if this is the case, it’s primarily the larger dwarfs that are responsible. In the figure above, the authors illustrate that even though small ( ) dSphs are more than twice as common and even though smaller dSphs lose a larger portion (>99%) of their metals, the larger ( ) dwarfs are responsible for introducing far more metals into the IGM.